The comedy – it wasn’t always timed perfectly – but there was plenty of humour and it was drawn from the characters. The action was solid and sometimes creative. The way The Losers could be casual when going up against what appeared to be tough opposition made a change from the oh to0 serious, walk slowly away from explosions without looking back school of action hero. The moment when Clay and Roque take a moment to enjoy an explosion was really refreshing. Thats when Clay and Roque really work – not when they’re banging heads. Jensen, the tech guy, wasn’t just there as a comedy element. He might not have been able to handle himself as much as some of the other characters but he wasn’t helpless or tied to a keyboard. He gets some good moments, especially in the sequence where he breaks into the office building. Jason Patric’s villain seems more self-aware of his villany than any bad guy since Benedict in Last Action Hero. He had something of an old school Bond villain about him but with a twist of Tarantino. Don’t Stop Believing is a nice song. I like it. I don’t own it but I like it. It’s a shame they couldn’t pick a song that’s not been done to death of late for such a prominent role in the soundtrack. With a different song the film could have been setting a trend rather than following where others have been. The styling was a bit in your face and a bit too obvious. Tropical Thunder has done for this school of action film what Monty Python’s Holy Grail did for coconuts as hoof beats. Thats a shame because if it had a bit more of its own visual language it could have been really great. I’ve not read the original comics. It’s a shame because the comic book imagery used at the start and end hints at a visual language that could have played a bigger part in the film without going down the 300 / Sin City route. Idris Elba: I like Idris Elba. I thought he was good in Ultraviolet and excellent in The Wire. Unfortunately since then he seems to be taking roles that involve him chewing the scenery as much as possible. That could be good. He can clearly act. “Stringer” Bell in The Wire had more range and greater subtlety than either his current part as Luther on the BBC or Roque and that is a shame. The plot isn’t full of wholes [note: that should be full of holes – normally I’d change it but I love that turn of phrase] but it doesn’t feel entirely developed or possibly not fully explained. It’s there more as a vehicle for the action. I’ll live with that – its true of plenty of action films and many have plots with bigger holes. The film didn’t allow me to invest in the characters destinies. I didn’t care enough about them. When they got shot I should have cared. When one of them goes bad I should have cared. I didn’t. That was the films major flaw for me. Die Hard is a good action film – it’s a great action film because I care what happens to John McClane. The same is true of Lethal Weapon and lots of other action films. There were things written in to make us like the characters in The Losers: the heroes rescue the children at the start and suffer for it, Jensen’s niece, Pooch’s pregnant wife and Clay’s problems with women. Everyone except Roque had something (and maybe what he needed was something to give him some depth). However it felt like the film maker begrudged having to use those humanising elements for anything other than comedy value. They might have been better off without the clutter and going for the anonymous ’60s style Mission Impossible agents defined by their relationships with each other. 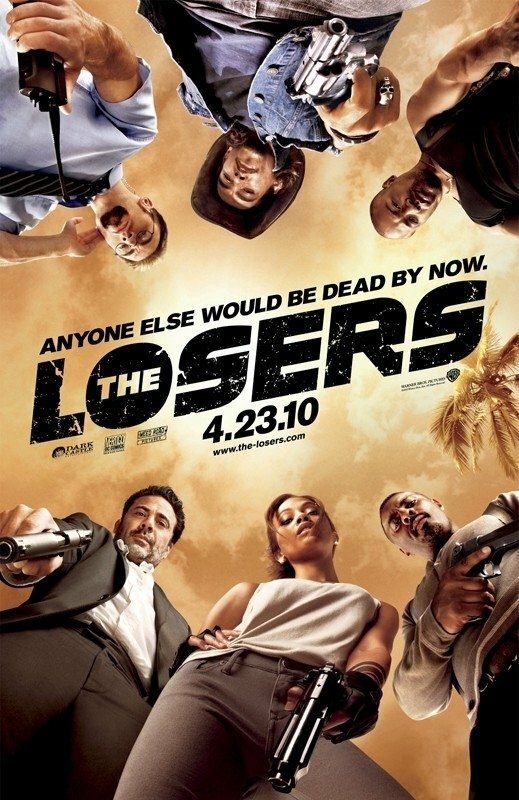 The Losers is a good, silly action film that I feel could have been an awful lot better had the style been a bit fresher and if I we’d been given a reason to care more about the characters. Maybe I’m analysing the film too much in the hope that there would be something else if I scratched the surface. I really wish that was what I ment to say. It is so much better than a bad typo. "The plot isn’t full of wholes" is a nice phrase, even if it is probably a typo!